On October 2014, the Italian company Olimpia 80 Tube Mills has completed the commissioning of a fully automatic tube mill, to produce Carbon steel (max T.S. up to 1400 N/mm²) and even Ferritic Stainless Steel tubes. The tube mill have a capacity to produce round tube and correlated sections, from OD 30 mm up to OD 88.9 mm in a thickness range from 0.8 mm up to 4 mm. The max production speed is 130 m/min. 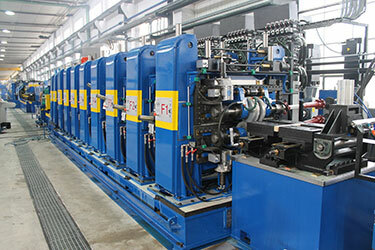 This Tube mill include some special features as a set of Cassette for Quick roll Change on rails, for welding, sizing and straightening (traditional) units; this system reduce drastically the waiting time when is necessary to change the production size. The best important news is the Universal Driven Turk’s Heads, positioned after the traditional sizing unit. The main capacity of the installed machine is from 20x20 (30x10) mm up to 70x70 (100x40) mm, in a thickness range from 0,8 up to 4 mm. With this system the tube mill will produce the full tube range (square and rectangular shapes) without changing any single roll in the sizing turk’s head stands. The straightening unit is not motorized and it is placed between the last two heads. Thanks to the software, the self-centring system allows to place the heads in position 0 (zero) depending on the tube’s size. The setting for the straightening is made through a control panel placed in front of the head. This system was engineered to have the possibility to install the complete device even in the existing line alternatively or consequently to a traditional turk’s head.